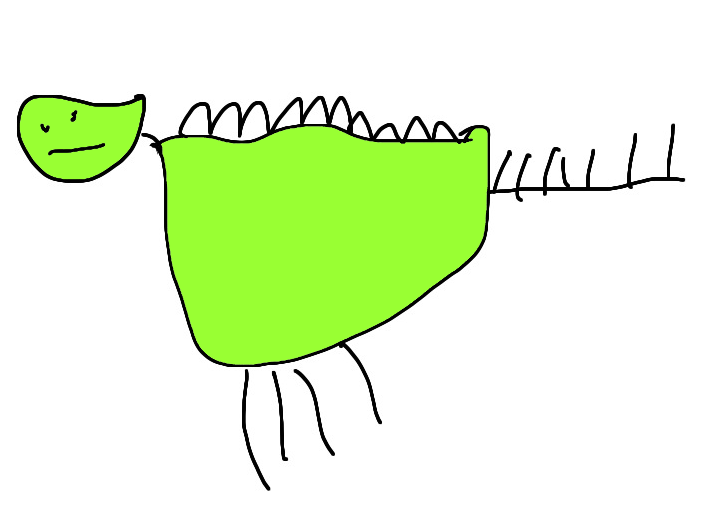 This is a story about Meg Mummisaurus who is looking for a good place for her egg to hatch safely. Her search takes some time as she meets lots of noisy, clumsy dinosaurs on the way. The story rhymes and has a strong rhythm that reads a bit like a rap poem, making it ideal for joining in. The illustrations are bold and funny too. 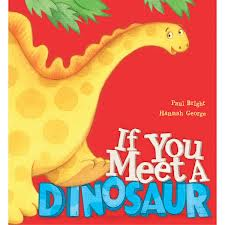 Before starting to read the book talk about the cover picture and the title which poses an interesting question ‘if you meet a dinosaur what would you do?’ Have fun reading the story aloud to your child enjoying the rhythm and rhyme together. Children will enjoy joining in with the exclamations perhaps wagging a finger as they say lines such as ‘Watch where you’re wagging your tail!’ You could point to these words as children join in. 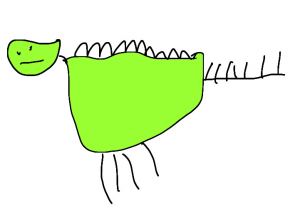 Children can also swagger, shake, stamp and stomp along with all the dinosaurs. You could leave gaps as you read for children to supply the missing rhymes. You could talk about the different places Meg Mummisaurus puts her egg, why she decides to keep moving it, and what’s happening at the end of the story. You need a balloon, white and blue tissue paper and glue (wallpaper paste glue or PVA). Cover a balloon with glue. Stick on torn pieces of white tissue paper. Cover with several layers of glue and tissue (between 4 and 6) leave the tissue covered balloon to dry. This may take a day or two. Pop the balloon .You will have an egg shape made of tissue. A nest can be made from twigs or screwed up newspaper. Children could retell the story using their toys as dinosaurs and moving their nest and egg to different places as Meg does in the story. This kind of play will help them understand story structure and enable them to try out some of the language. I’m Not Going Out There!